You may never have experienced an accident in a retail store or supermarket, even though the premises into which businesses invite their customers sometimes present unsafe conditions that pose very real hazards. However, if you or a someone you know has been injured during what should have been a quick trip to run errands, it is crucial to talk to an experienced Wyoming personal injury attorney to determine your best course of action, to analyze your claims and to preserve evidence you will need to prosecute and enforce your claims. Arnold Law Offices can play a vital role in accomplishing these essential requirements. Store’s Awareness, Response and Policies. Many unforeseen hazards potentially exist on the premises of a retail store or supermarket. These hazards can develop over a long period of time, over the course of 15 minutes or in a matter of moments. The awareness of, and the response to, an existing hazard by the store’s manager and employees, and the store’s corporate policies and procedures for identifying and mitigating hazards, will be important factors that bear upon whether the store is responsible for injuries suffered by a customer. For example, if a tile which has become loose is pointed out to the manager by an employee or customer, but no action is taken, then it is reasonable to hold the store’s corporate owner accountable when a customer trips on the loose tile and takes a hard fall while striking his head on a display case. Another example would be a customer dropping a bottle of olive oil on the floor but failing to report it to a store employee. Then, another customer walks down the same aisle and slips in the oil because, while she was looking at condiments, she did not see the hazard. As a result, the customer breaks her leg. Factors in Legal Analysis. A broader range of considerations on which the analysis of an experienced Wyoming personal injury will focus could include: i) producing the store’s written policies for conducting inspections designed to discover and report hazards, ii) the length of time the hazard was present and the time of notice of the hazard, iii) industry standards and City Code’s that may have been violated, iv) scientific standards relating to the coefficient of friction of the floor surface material or the force of impact, v) locating eyewitnesses, and vi) the timeliness of the response of the store’s employees after first learning of the hazard. The legal analysis might also consider whether an employee discovered the spill but left the hazard unmarked and without being cordoned off while the employee searched for the janitor who then searched for the misplaced mop and cleaning supplies. Even if liability is not initially clear, there are numerous lines of inquiry that can be explored in the search for a credible argument that the store’s corporate owners, its managers or its employees violated the duty of care owed to all customers. The person suffered actual harm. The harm suffered may quantifiable such as a monetary loss of wages and the incurring of medical debt and it may be intangible but compensable at law, such as with pain and suffering and loss of enjoyment of life. Although this list addresses the most common types of damages, it is not comprehensive. A skilled personal injury attorney can provide more specific information based on the specific facts of a particular situation. 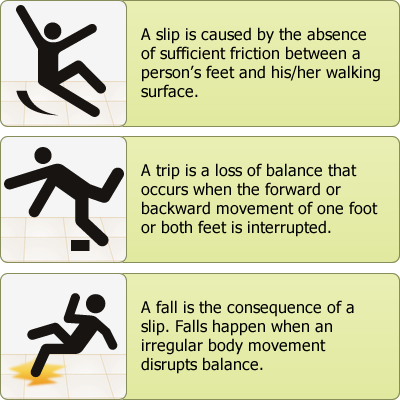 If you have been injured in a slip and fall, or another type of accident when visiting a store or supermarket, contact the Wyoming Personal Injury Attorneys of Arnold Law Offices to set up an initial consultation. Arnold Law Offices serves all of Wyoming, including Uinta, Sweetwater, Lincoln, Carbon, Teton, Fremont, Natrona and Laramie Counties. Call (888) 760-4357 or (307) 789-7887 to make an appointment.